Robert Greenberg and the Alexander String Quartet worked their magic again this year in a lecture/performance Saturday morning at Berkeley’s St John’s Presbyterian Church. Collaborating to investigate the early Felix Mendelssohn, the musicians were swelled by the Hausmann quartet for Mendelssohn’s unique Octet in E-flat. Written when he was only 17, the Octet goes beyond promise: fully fledged, he truly soars in this piece. Greenberg washed his erudition down with humor. “Child prodigies—is there anything more annoying?” he opined, then proceeded to describe Mendelssohn as unique even among prodigies, as he went beyond gifted accomplishments to a mature creativity. Revealing that the inspiration for the Octet was Goethe’s Faust, Greenberg showed us the themes of each movement, with musical excerpts furnished by the musicians, and how each related to elements of the novel. “Faust is about redemption, not damnation,” continued Greenberg as he described the two moods of the second movement: C minor with darker lower strings to depict Faust’s torment and bargain with the devil, and sweet D-flat major in the high register of the violin, the angelic voice of his love, Gretchen. Mendelssohn was also an accomplished violinist, and this work bordered on concerto, with Zakarias Grafilo as violin soloist. Grafilo’s verve and assurance cast the orchestral parts in strong relief. ASQ stalwart Sandy Wilson, doubled by Hausmann cellist Yuan Zhang, answered Grafilo’s opening phrase. The effect of the doubling was to add gravel to a lean and muscular line, exploring the territory between solo and section. Unlike a quartet, the fabric of the octet was tightly woven, with seconds filling in the ground between notes. For example, when ASQ violist Paul Yarbrough played a phrase, Hausmann violist Angela Choong bowed soft echoes into the pause. The closeness, surprising for a group this size, was less remarkable as the Hausmann quartet is being mentored this year at San Francisco State by the ASQ, and one could sense their rapid accommodation and unity of subtle tempo changes. In the second half of the program Greenberg introduced the themes of Mendelssohn’s String Quartet in A minor, namely his first love and his exposure to Beethoven’s late quartets. Quoting a love poem, “Ist es wahr?” (Is it true), which the young Felix set, possibly for Betty Pistor, a close family friend, Greenberg showed us how he manipulated the themes of his poem-song throughout the quartet. Felix’s father, Abraham Mendelssohn, acquired copies of each of Beethoven’s works on first publication despite his own misgivings about that “avant-garde” composer, and Felix studied them well. His string quartet came out two months after Beethoven’s death, and, quoting Beethoven, it appears to be Mendelssohn’s tribute to the older genius. But that hardly stopped him from trying to improve on Beethoven! He borrowed themes from at least three of his quartets and continued to develop them. But Mendelssohn’s quartet has the sweetness of youth, and contains a lyricism that marked his whole career. And this quartet in particular explores early themes of love, themes that Beethoven barely hinted at in his mysterious final works. After the lecture, the ASQ, primed by their intense cooperation in the Octet, reveled in the music. Perfect harmonies, rich and graceful treatment, and the excellent acoustics of the wood-clad chapel made for a memorable rendition. And Greenberg’s analysis did something else—it supplied a much-needed rehearsal for the audience! 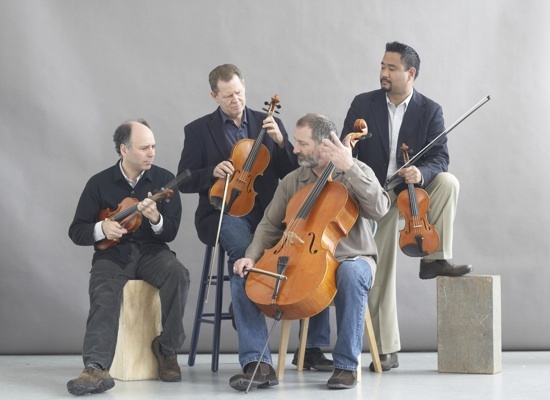 Photo of the Alexander String Quartet from left, Frederick Lifsitz, Paul Yarbrough, Sandy Wilson and Zakarias Grafilo; photo by Rory Earnshaw.